HOUSING PARTNERS: Gov. Ige joins Kaua’i officials and advocates at blessing for the Kaniko’o Rice Camp rental apartments for seniors. 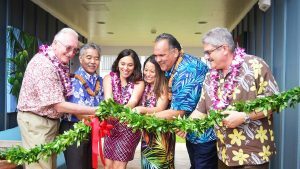 • Projects increased statewide – From O‘ahu and Maui County to Kaua‘i and Hawai‘i island, more than 20 rental and affordable for-sale projects have opened in the last three years or are in the pipeline for the future. Many of the projects target residents whose incomes are at or below 60 percent of the area median income (AMI). On O‘ahu, that would mean a family of four making about $60,000 a year. “This governor has put the emphasis on affordable housing for working families,” said Craig Hirai, executive director of the Hawai‘i Housing Finance and Development Corporation (HHFDC). • New future for Kalihi envisioned – A community vision team, working with the state Office of Planning, has completed its Kalihi 21st Century Transformation Initiative — fulfilling a promise the governor made in his 2016 State of the State address to “revitalize Kalihi.” “Being part of the planning process from the start was empowering, but it also shows that Governor Ige cares about what we think and want and need,” said long-time Kalihi resident April Bautista. “He promised he would work with us to create a vision for Kalihi and he delivered.” The transformation of Kalihi will depend on the relocation of the aging O‘ahu Community Correctional Center, which sits along the path of the city’s planned rail line. • More homestead lots for Native Hawaiian families – For the Department of Hawaiian Home Lands, the Ige administration secured the highest level of state funding ever at $23.9 million, more than double that of the previous administration. DHHL will continue to provide more vacant lots prepared for housing construction, turnkey homes and subsistence agriculture awards. The Kalihi 21st Century report shows how Pu’uhale Rd. could become a walkable, mixed-use district of housing and businesses to transform the Kalihi area. The governor praised the community vision team that included resident April Bautista and Office of Planning director Leo Asuncion.